Enter the world of war were rulers of nations set out to conquer land and search for fame and treasure. Join the warlords in this fantastic Netent game Warlords - Crystals of Power and experience fantastic entertainment in this beautifully designed slot game. The background shows an animated battlefield, but what really stands out are the graphics, and we don't expect anything less from Netent. 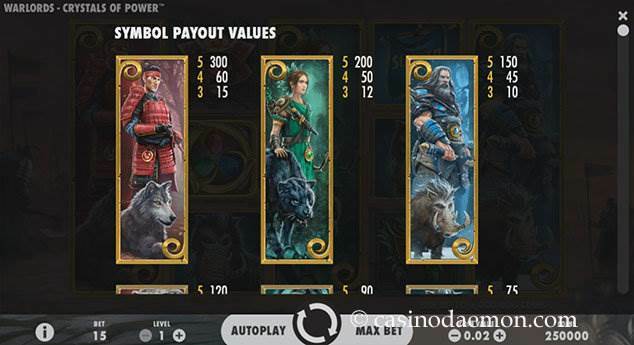 A refreshing change is that the game does not have the standard poker symbols, instead they have beautifully drawn graphics of animals and war masks for the lower paying combinations. You can also find three warlords with their animal companions as stacked symbols and fight with them side by side. The game is accompanied by powerful music in a Celtic style which further enhances the tense atmosphere. 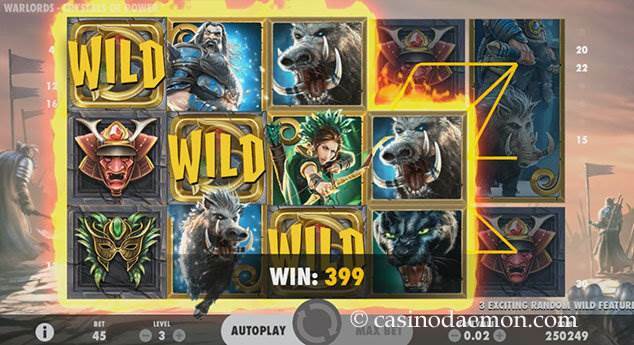 The special features of the game include wilds and interesting free spins with multipliers and extra wilds. Warlords - Crystals of Power has a low to medium volatility (variance), which means that you can win money regularly, although it is usually smaller amounts than large amounts, but it is not unlikely that you win a large amount. The special features also trigger relatively often. The theoretical return to player is 96.89%, which is on the higher end of online slots. You can also play Warlords - Crystals of Power slot mobile on go on different devices, as the game is designed in HTML5 and compatible with many devices. If you would like to try this fantastic game from Netent, you can play Warlords - Crystals of Power for free here and see for yourself how the game works, and especially how fantastic the graphics are. If you wish to play the game for real money you can find it in one of the online casinos mentioned on this page. The game has a lot to offer in terms of features. For example, there are a random overlay wild symbols which can be triggered in a spin. There are three different types: the hammer gives you 4 wild symbols in shape of a square, the arrow gives you between 2 and 5 wilds and the sword also gives you between 2 and 5 wilds. These wild symbols can stand in for any other symbol, but not the scatter symbol, to complete winning combinations. There are also regular wild symbols that can appear during the spin. There are three different scatter symbols and each of it can start the corresponding free spins. The blue symbol search the Barbarian free spins, the green symbol the Priestess free spins and the red symbol the Samurai free spins. 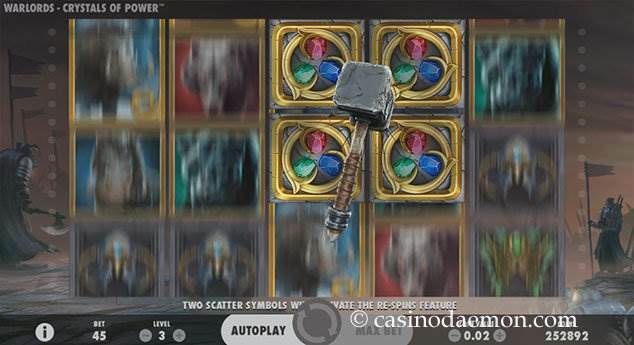 When you get two or more scatter symbols on the reels you also get a re-spin, and if they are different types they will also start a battle during which it will be determined which type of free spins you will get. You need three scatter symbols to start the free spins, however, if they are not triggered after the re-spin you will get a final chance of triggering them. The final chance either gives you a coin win or another scatter symbol. During the free spins, you will get a number of free spins, multipliers and wild symbols, and you can also win additional free spins. Overall, the free spins scatter feature seems a little confusing at first, but once you play the game for a while it will become clear how the re-spins and different scatter symbols work. It is also not impossible to trigger the free spins, and while testing the game they started regularly. Warlords - Crystals of Powerfrom Netent is a 5-reel slot with 30 fixed pay lines. All pay lines are played with 15 coins. You can select from coin values between 0.1 €/£/$ up to 1 €/£/$, and also select a play between 1 and 10 coins per line. 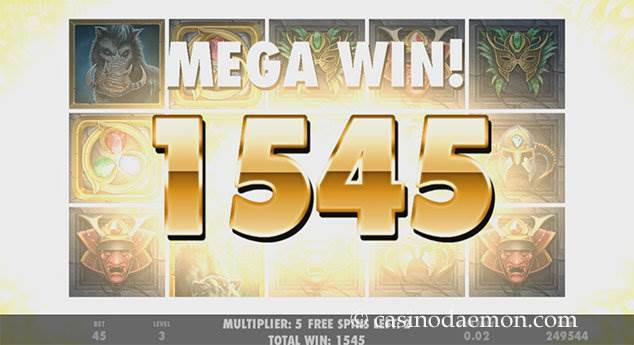 The minimum bet to play this game is 0.15 €/£/$, and you can raise your bet up to 150 €/£/$ in a single spin.